Modern industrial gold mining destroys landscapes and creates huge amounts of toxic waste. Due to the use of dirty practices such as open pit mining and cyanide heap leaching, mining companies generate about 20 tons of toxic waste for every 0.333-ounce gold ring. The waste, usually a gray liquid sludge, is laden with deadly cyanide and toxic heavy metals. Many gold mines dump their toxic waste directly into natural water bodies. The Lihir gold mine in Papua New Guinea dumps over 5 million tons of toxic waste into the Pacific Ocean each year, destroying corals and other ocean life. Companies mining for gold and other metals in total dump at least 180 million tons of toxic waste into rivers, lakes, and oceans each year—more than 1.5 times the waste that U.S. cities send to landfills on a yearly basis. To limit the environmental damage, mines often construct dams and place the toxic waste inside. But these dams do not necessarily prevent contamination of the surrounding environment. Toxic waste can easily seep into soil and groundwater, or be released in catastrophic spills. At the world’s estimated 3,500 dams built to hold mine waste, one or two major spills occur every year. Toxic waste spills have had devastating consequences in Romania, China, Ghana, Russia, Peru, South Africa, and other countries. In 2014, a dam collapsed at the Mount Polley gold and copper mine in British Columbia, sending about 25 million cubic meters of cyanide-laden waste into nearby rivers and lakes—enough to fill about 9,800 Olympic-sized swimming pools. The spill poisoned water supplies, killed fish, and harmed local tourism. Dirty gold mining often leads to a persistent problem known as acid mine drainage. The problem results when underground rock disturbed by mining is newly exposed to air and water. Iron sulfides (often called “fool’s gold”) in the rock can react with oxygen to form sulfuric acid. Acidic water draining from mine sites can be 20 to 300 times more concentrated than acid rain, and it is toxic to living organisms. The dangers increase when this acidic water runs over rocks and strips out other embedded heavy metals. Rivers and streams can become contaminated with metals such as cadmium, arsenic, lead, and iron. Cadmium has been linked to liver disease, while arsenic can cause skin cancer and tumors. Lead poisoning can cause learning disabilities and impaired development in children. Iron is less dangerous, although it gives rivers and streams a slimy orange coating and the smell of rotten eggs. 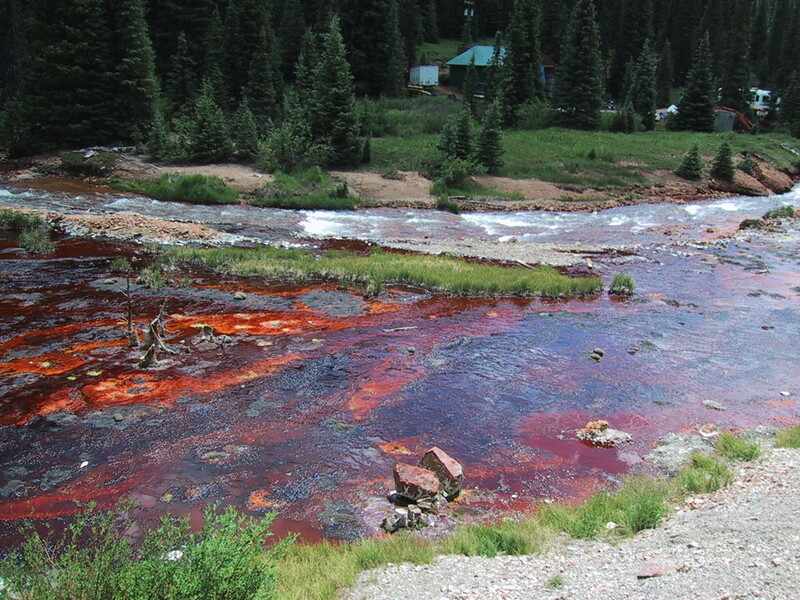 Once acid mine drainage starts, it is difficult to stop. Acidic waters flowing from abandoned mines can raise acidity levels and destroy aquatic life for generations. Roman mining sites in England are still causing acid mine drainage more than 2000 years later. The use of mercury in gold mining is causing a global health and environmental crisis. Mercury, a liquid metal, is used in artisanal and small-scale gold mining to extract gold from rock and sediment. Unfortunately, mercury is a toxic substance that wreaks havoc on miners’ health, not to mention the health of the planet. 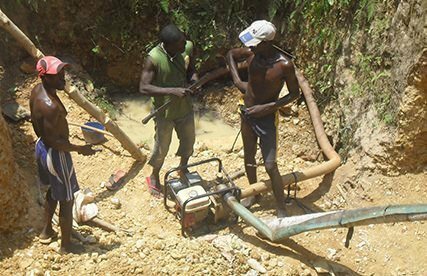 For every gram of gold produced, artisanal gold miners release about two grams of mercury into the environment. Together, the world’s 10 to 15 million artisanal gold miners release about 1000 tons of mercury into the environment each year, or 35 percent of man-made mercury pollution. Artisanal gold mining is actually among the leading causes of global mercury pollution, ahead of coal-fired power plants. When mercury enters the atmosphere or reaches rivers, lakes, and oceans, it can travel across great distances. About 70 percent of the mercury deposited in the United States is from international sources. Still more mercury reaches the United States through imported fish. Once it reaches a resting place, mercury is not easily removed. Sediments on the floor of San Francisco Bay remain contaminated with mercury left by the California gold rush of the 19th century. Mercury is extremely harmful to human health. The amount of vapor released by mining activities has been proven to damage the kidneys, liver, brain, heart, lungs, colon, and immune system. Chronic exposure to mercury may result in fatigue, weight loss, tremors, and shifts in behavior. In children and developing fetuses, mercury can impair neurological development. A gold mining boom is accelerating the destruction of the Amazon rainforest, a biologically diverse ecosystem that acts as a check on global warming. Artisanal, or small-scale, gold miners are tearing down the forest to access the rich gold deposits beneath. One study found that deforestation rates in the Madre de Dios region of the Peruvian Amazon have increased six-fold due to gold mining. Gold mining is also responsible for releasing large amounts of mercury into the Amazon’s air and water. The mercury is poisoning plants, animals, fish, and people. In one city in the Peruvian Amazon, unsafe mercury levels were recorded in 80 percent of local residents. The gold mining boom does not bode well for the Amazon or the people, both locally and globally, who depend on it.